World Premiere Performance recorded live with the 130-voice VocalEssence Chorus and Orchestra, conducted by Philip Brunelle, featuring soprano Maria Jette, mezzo Krista J. Palmquist, tenor Anders Eckman and bass-baritone James Bohn, at the Ted Mann Concert Hall, Minneapolis, Minnesota, November 15, 2008. Of this premiere performance of Kaddish, the Minneapolis Star Tribune said: "... In its lyrical simplicity, the music created an emotional connection to the story. 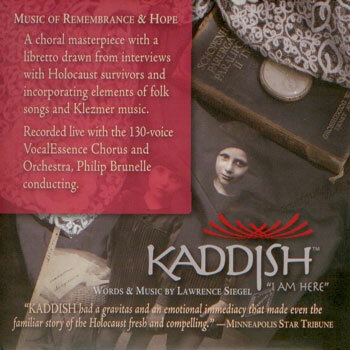 Kaddish had a gravitas and an emotional immediacy that made even the familiar story of the Holocaust fresh and compelling." The Minnesota Pioneer Press said: "... Joy of a kind born in resiliency emerges like a glow of white light in the final section of Lawrence Siegel's oratorio ... the impact of the conclusion is thrilling." To learn more visit the Kaddish Project website.